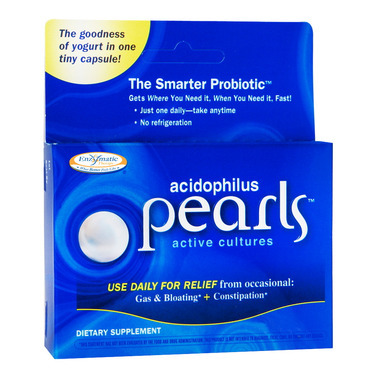 Enzymatic Therapy Acidophilus Pearls contain the goodness of yogurt in one tiny capsule! They're the Smarter Probiotic -- just take one daily, anytime! They require no refrigeration, so you can take them anywhere you need to go. Enzymatic Therapy Acidophilus Pearls provide live microorganisms that form part of a natural healthy intestinal flora. Beneficial probiotics can help you get relief from occasional gas, loose stools, constipation, sensitive stomach and lactose intolerance. Directions: Take 1 capsule (pearl) daily with water or your favourite beverage. May be taken with or without food. Do not chew or crush.